It’s been almost a year since my visit to Vietnam. I can’t believe how fast time flies. It feels like I was just basking on the sun deck of the Emeraude, sailing in the beautiful waters of Halong Bay. Vietnam was one of those trips that I just didn’t want to end. When I was there, I fell in love with the country’s extraordinary beauty and charming people. I’ve never before experienced a country whose people were so warm and receptive to tourists. Despite America and Vietnam’s history, the Vietnamese people hold no animosity towards us. In fact, if you don’t speak Vietnamese, you really only have to smile to communicate with the people. After spending two weeks in the country, I wanted to make sure our Taste of Vietnam tour was giving something more than just tourism back to the country. I set out to find opportunities for our travelers to directly give back to the locals of the towns they are visiting. So now on the Taste of Vietnam tour, we bring travelers to KOTO. It is a nonprofit restaurant and vocational training program that is changing the lives of disadvantaged youths in Vietnam. A portion of what our travelers spend there goes directly back to KOTO to continue to improve the lives of Vietnamese children. Another place we visit, en route to Halong Bay, is a shop where travelers can buy paintings and jewelry. The profits from the shop go to a school that teaches handicapped Vietnamese to become artisans. The students then create all of the artwork in the shop our travelers visit. Everything you buy directly benefits students at the school. Better yet, these two places are not often visited by tourists. So you get to not only give a little something back to this beautiful country, but you also get to see some places off the beaten trail. In addition to finding these great social causes in Vietnam, I found more ways to make the eight-day Taste of Vietnam tour even better. For $1,199 you’ll also visit two of Vietnam’s most dynamic and culturally awe-inspiring cities, Ho Chi Minh City (Saigon) and Hanoi. The price includes round-trip airfare from Los Angeles, all intra-Asia flights and ground transportation, superior hotel accommodations, daily buffet breakfast, and comprehensive sightseeing in each city with a local, English-speaking Vietnamese guide. The tour immerses travelers in the country’s rich culture, starting with Ho Chi Minh City (still called Saigon by many locals) and ends in Hanoi. 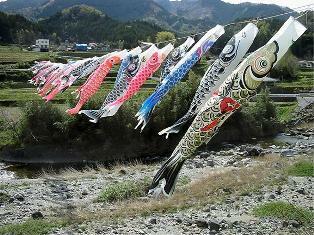 They see the country’s floating markets, winding canals, sweeping rice paddies, and bustling cityscapes. Travelers also take a step back into the country’s history with a trip to Hoa Lo Prison, also known as the “Hanoi Hilton,” and the Cu Chi Tunnels that were part of the underground highway of the Viet Cong. There is also an array of discounted optional tours, including the Halong Bay overnight cruise, my personal favorite. Travelers stay aboard a deluxe river boat, the Emeraude. It’s a replica of one of the classic steamships of the colonial era of French Indochina. You feel like you’re in the movie, “Indochine,” which consequently, is played on your stay. And if that still isn’t enough, take advantage of your already included international airfare and spend three additional nights in Bangkok, Thailand. 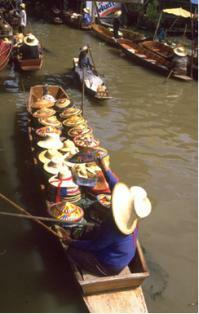 Visit what is often called the “Venice of the East” for its network of canals (klongs), and explore Bangkok by boat. Book our eight-day Taste of Vietnam tour for $1,199 by Feb. 24, 2010. As I said earlier, it’s almost impossible not to fall in love with this amazing country and not want to leave. For complete details, visit our Web site. If you have any questions, send me an e-mail. As you probably picked up from my series of posts about my own Vietnam experience, Vietnam today draws thousands of Americans eager to fully understand the country, its people, culture, and ways of life — despite its controversial past. But this remarkable journey has traditionally come with a high price tag, with tour prices easily exceeding $2,000. Until now. Last week, we unveiled our ultra-low-cost Taste of Vietnam vacation deal. The examiner.com picked up the press release we sent out last week with the full details. You can also read on below for more information. The package, starting at just $999, visits two of Vietnam’s most dynamic and culturally awe-inspiring cities: Ho Chi Minh City (Saigon) and Hanoi. The trip includes round-trip airfare from Los Angeles (with JFK departures available at a surcharge of between $150 and $200, depending upon departure date); all ground transfers; all intra-Vietnam flights; six nights in superior hotel accommodations; daily buffet breakfast; and comprehensive sightseeing in each city with a local, English-speaking Vietnamese guide, including entrance fees. 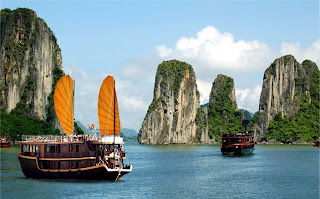 Travelers can also choose from an array of discounted optional tours, such as Halong Bay, which can be done in one day or an overnight stay aboard a deluxe river boat, the Emeraude, as well as an optional extension to Bangkok, Thailand. There’s no doubt that Vietnam is spellbinding, and allures travelers for so many reasons. Its exotic location has shielded it from throngs of tourists and trampled habitat, fast food chains, and strip malls that often accompany those groups. The country’s pivotal role in recent history also draws many U.S. veterans who want to return to Vietnam to find closure, see how the country has changed, find old haunts, and even rediscover old friends. There are also many Vietnamese people who settled in the U.S. in the years following the war who are longing to return for a visit, and whose children have never seen the homeland of their parents. Before now, maybe they couldn’t afford it. But now travelers can do it all for $999. That’s a deal that I’ve never seen in my 30 years of travel experience. Among savvy travelers, Vietnam has emerged as one of Asia’s most popular new destinations. The fascination for Vietnam comes from its extraordinary beauty; simplicity of life; and warm, incredibly approachable people. The tour, conducted by English-speaking, Vietnamese licensed guides, immerses vacationers in the country’s intense beauty and rich culture, starting with Ho Chi Minh City (still called Saigon by many locals) and ends in Hanoi. Vacationers get a taste of life in modern day Vietnam, with the country’s floating markets, winding canals, sweeping rice paddies, and bustling cityscapes. They also take a step back to the country’s controversial past, including a trip to Hoa Lo Prison, also known as the “Hanoi Hilton,” and the Cu Chi Tunnels that were part of the underground highway of the Viet Cong. For travelers with more time, Friendly Planet Travel also offers a 13-day Best of Vietnam trip for the low price of $2,399, with optional extensions to Angkor Wat in Cambodia and the Sapa Hill Tribes. The 13-day fully escorted tour takes vacationers from south to north — with stops in Ho Chi Minh City, Hue, Da Nang, Hoi An, and Hanoi. For both vacations, on sale prices include savings of up to $800 per couple if reserved before Aug. 28. If you’d like more information, or want to book, please visit our online booking agent, or contact us. Today marks the third installation of my Journey through Vietnam series. I’ve taken you from the bustling streets of Saigon to the captivating and impoverished life along the Mekong Delta. After more demonstrations on candy and rice paper making, and some time to buy a few treasures, we got back on the boat and continued to our final destination. We were on our way to an old, elegant house originally built in the 1830s, tucked away in a village a mile or so inland from the river. This house had been passed down from one generation to another, lovingly preserved and now operated by a great granddaughter of the original owner. 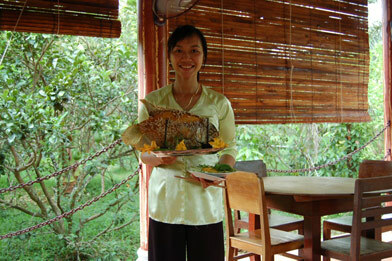 She has opened a restaurant in the house where visitors to Vietnam can sample the cuisine of the Mekong Delta region. If this woman were to come to New York and open a restaurant there, she would definitely hit it very big. But she’s not likely to leave her house (of which she is enormously proud) or her current thriving restaurant business. On the day of our visit, she prepared a succulent lunch of no fewer than five courses, including baked elephant ear fish (a local specialty, freshly caught that morning), several varieties of spring rolls, shrimp and vegetable dishes, and the ubiquitous sauces that make Vietnamese cuisine irresistible. All of this was prepared on four little burners in an immaculate kitchen that is missing most of the conveniences the average American house takes for granted. Yet, the lunch was served perfectly prepared, at the perfect temperature for each course, with every one of the 16 diners being served at the same time. 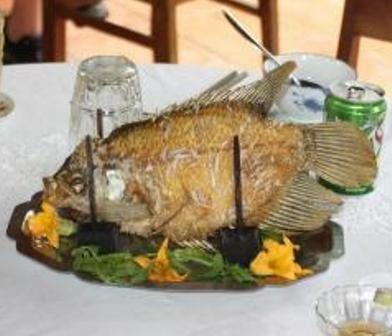 The main course, Vietnamese elephant fish! Our talented chef accomplished this culinary miracle with the help of four lovely young Vietnamese women, all of whom — despite the day’s oppressive heat — were dressed in the beautiful “long dress,” without a sign of discomfort from the heat which had the rest of us guzzling bottle after bottle of anything cold and wet. The dessert was, of course, fruit from the trees in the garden of the house. The pineapple was just picked, as were the mangosteens, mango, papaya, melons, and bananas. Every piece of fruit was unbelievably sweet. There was never a need to add anything. Needless to say, I was in heaven, although I was so full I felt like I might have had to be carried back to the boat. A closer look at the famous elephant fish. Yummy!